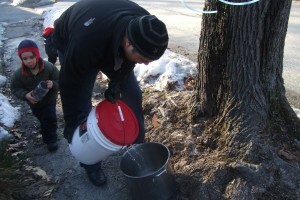 Remember the lonely maple tree out in front of our house that we tapped a few weeks ago? 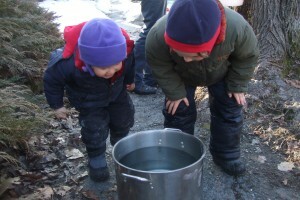 Well, she is indeed bearing sap–and lots of it! We have one five gallon bucket hanging on the tree, and for the past few weeks we’ve been emptying full buckets of sap about every three days–though sometimes the sap runs faster, and sometimes more slowly, depending on the weather. I’d estimate that so far the tree has given us about 20-25 gallons of sap. 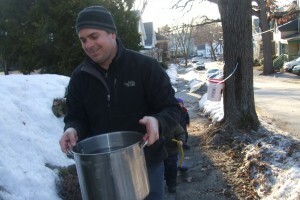 Ben usually checks the bucket at the end of the day when he gets home from work (the tree is right next to where he parks his car–who knew maple sugaring could be so convenient! 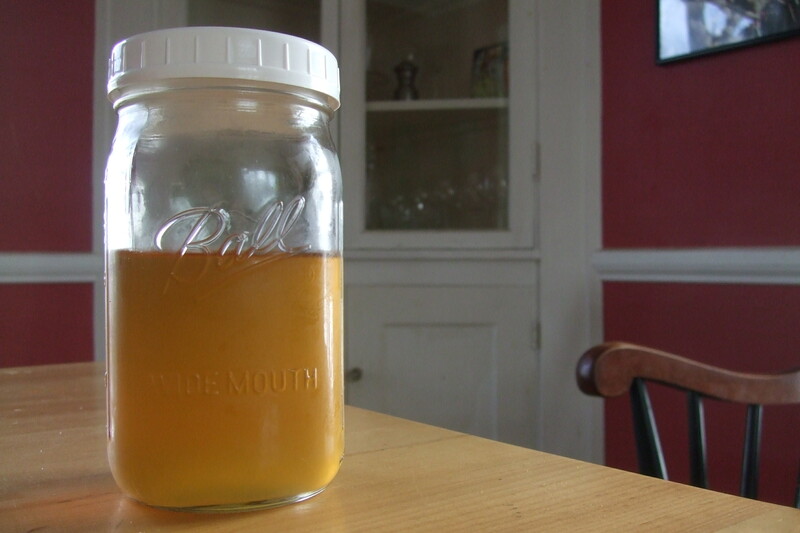 ), and brings it in if it’s getting close to full. We put the sap on the stove to boil down during the evening, until it has reduced substantially and has taken on a nice light golden-brown color. 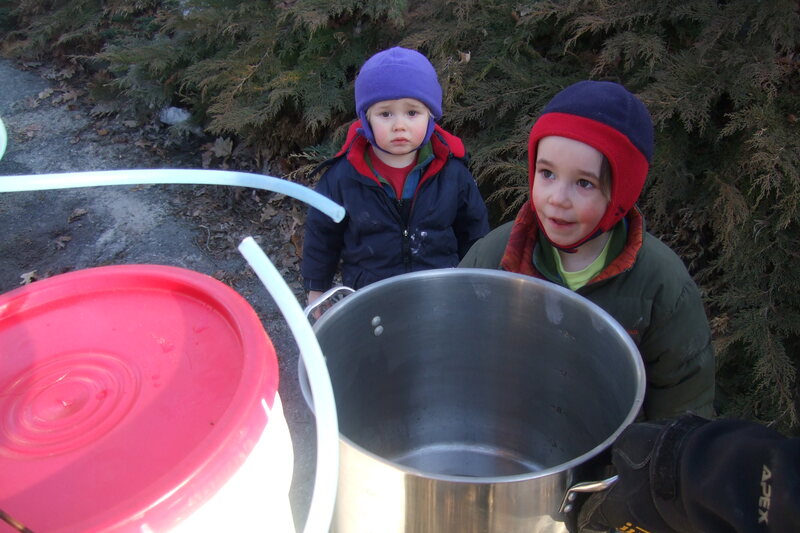 Technically speaking, maple syrup is “done” when it has a sugar content of 66-67 percent at a temperature of 7.1 degrees above regular boiling temperature (212 degrees at sea level, or lower if you are at altitude), and this can be measured with a hydrometer. But, we have not been using one, and at least for now we are taking a much less technical approach. Eventually, the sap starts to look like syrup–though a bit lighter and thinner than what we’re used to in the commercially available stuff–and that’s when we know it’s done. For us, this ends up being a ratio of about 40:1. So, after boiling down 5 gallons of sap we end up with about one pint of maple syrup. Certainly there is variation on this ratio, and I know that some folks use a ratio of more like 36:1, but for us, 40:1 is how it tends to work out. 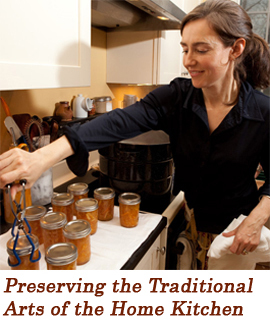 Depending on how much sap we boil down at one time–anywhere between 3 and 5 gallons, usually–it’s often done by the time we’re ready to go to bed. Though, if its a big batch, sometimes I have to finish it the next day. 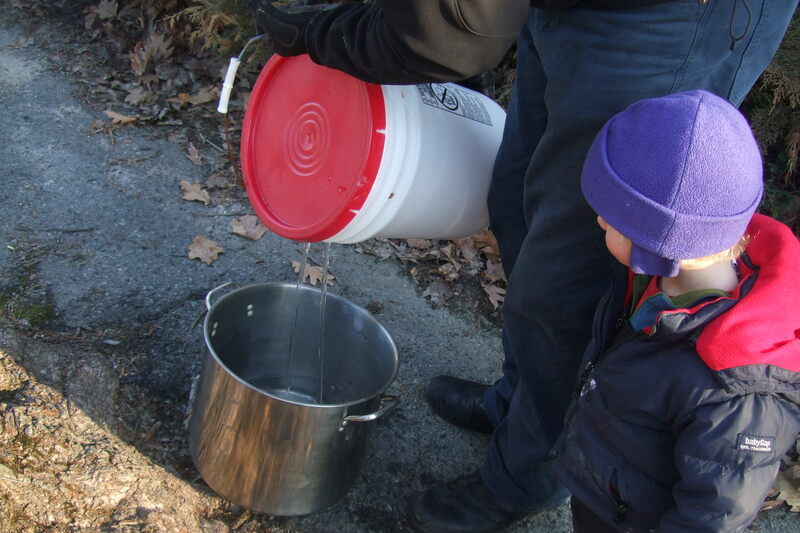 I can see why people traditionally boiled down sap outside….the process definitely creates a lot of steam. We have a very powerful hood over our stove, so boiling it inside has worked fine for us, but a good ventilation system is essential if you’re making syrup indoors. In any case, the syrup is delicious! 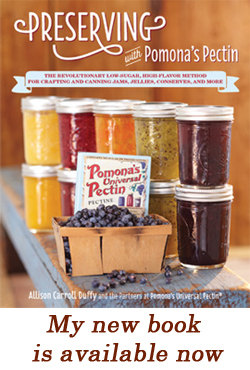 We love it on pancakes, in hot cereal, and in yogurt (not to mention by the spoonful!) What a lovely gift from that quiet, gnarled maple, just outside our dining room window.